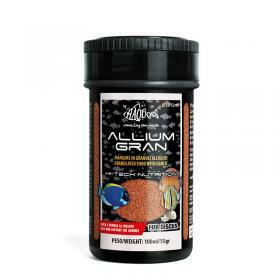 Compound granulated food special for Discus and also other aquarium fish daily feeding. Selected with higth protein, vitamins and metabolic ingredients (garlic) to enhance colours and to increases immune and reproductive system. It inhibits rickets and avitaminosis, mitigate stress and shyness and increases fish sociability. Fish, meat, spirulina, garlic, wheat, shellfish, shrimp, rice, seaweed, soy, brine shrimp, carrots, spinach, lecithin.